Takota McAllister stands ready with a can of silly string, to spray during the Wild Ride at the 2018 Red Bluff Round-Up, as his friend, Colby Demo, a bull rider, kneels. The two have become good friends, and Takota dreams of being a cowboy when he grows up. 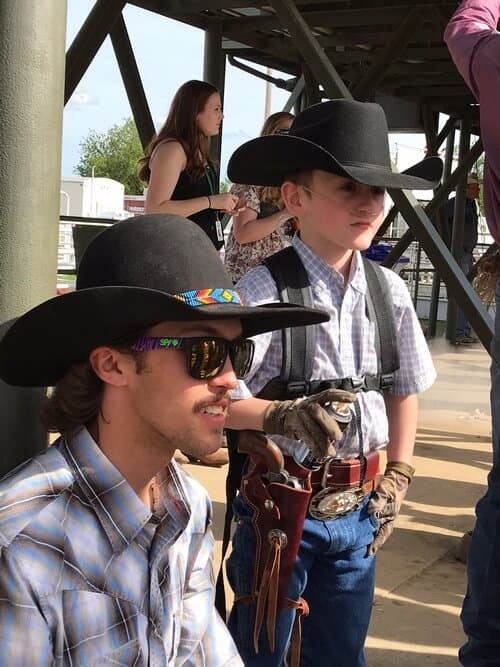 Red Bluff, Calif. – A special little boy has a special friend at the Red Bluff Round-Up. 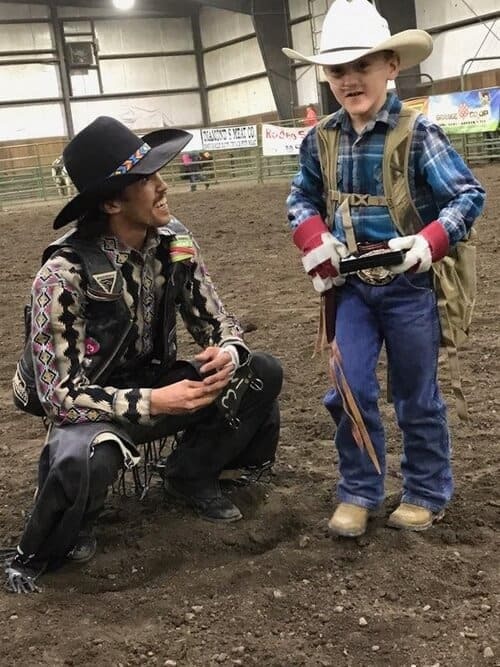 Takota McAllister, from Weed, is friends with bull rider Colby Demo, from Gerber. But it’s not just any friendship, but a special one. Takota, who is nine years old, was born prematurely. His lungs do not work correctly; he’s on oxygen around the clock, and he has an immune deficiency that limits how much he can be in public. His mom, Christina McAllister, home schools him to keep him away from the germs that can be found in school. Any infection he gets could be detrimental to his health. Sometimes when he’s out with Demo, he wears his oxygen tank in a backpack. Takota loves rodeo, and met his friend Colby at a rodeo in Oregon. Colby had Takota help him get ready to ride a bull, and when Colby won the bull riding, he gave the buckle to Takota. They are fast friends. Colby and his buddies stop by to see Takota if they’re in the area. Takota and his mom travel to Colby’s rodeos when they’re close, and a few months ago, Demo and his friends took the boy snowboarding. Bull rider Colby Demo gave one of his winning rodeo buckles to his friend Takota McAllister. Takota, who lives in Weed, Calif., has an immune deficiency and is on oxygen, due to complications from birth. And when Demo rides in Red Bluff, his friend Takota will be in the stands, cheering him on. The Round-Up will be held this Friday, Saturday and Sunday at the Tehama District Fairgrounds. Performances begin at 7 pm on April 19, at 2:30 pm on April 20 and at 1:30 pm on April 21. Tickets range in price from $14 to $30, with a handling fee, and can be purchased online at www.RedBluffRoundup.com or at the gate. For more information, visit the website or call the Round-Up office at 530.527.1000.